Amazon is one of the largest ecommerce websites in the world and so has become a key online partner for just about every brand across all major retail categories. With each passing year, Amazon becomes a bigger part of brands' online and omnichannel strategy. It is estimated that 44% of shoppers looking for products online start on Amazon, more than those who start product searches using traditional search engines, such as Google, Bing, and Baidu. Furthermore, in 2015 Amazon generated $88bn revenue in the United States capturing 51% of all growth in the ecommerce channel, with a further $107bn of revenue generated across global markets. With Amazon Prime subscriptions growing, AmazonFresh now launched in multiple markets, and increased investment outside of the US, there is no sign of the Amazon juggernaut slowing down. Manufacturers that optimize brand performance on Amazon now will not only see online sales increase, but improve their influence and share of shelf from an omnichannel perspective as well. We've aligned our guide to the online shopper’s path to purchase of "Find, Experience, Buy" to give you the tools and knowledge you need to win the digital shelf on Amazon. We'll give you actionable strategies and tactics to improve your products' Amazon rank, including a deep dive on Amazon's search algorithm and what drives Amazon SEO. We'll show you how to develop ecommerce product content that converts, including A+ and enhanced content, and ultimately how to win the buy box on Amazon and thwart third-party sellers. We'll also cover how to engage shoppers on Amazon's influential ratings and reviews platform, as well as outline Amazon's promotional suite--Lightning Deals, Subscribe & Save, and the variety of advertising opportunities available. 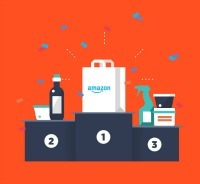 Download our Definitive Guide to Optimizing Brand Performance on Amazon and give your brand the edge over your competition and improve your Amazon ranking.